The second largest continent in terms of both size and population, Africa covers an enormous area of over 11.7 million square miles (30.3 million square km). This means that Africa makes up about 20% of all land on Earth and is home to over 1.2 billion people. The continent of Africa has shoreline along the Mediterranean Sea, the Atlantic Ocean, and the Indian Ocean, and is made up of 54 fully official countries and two independent states with limited recognition. Examples of African countries include Algeria, Kenya, Egypt, and Cameroon. The African continent is generally regarded as the birthplace of mankind, with archaeological evidence being found in Eastern Africa to show that the earliest hominid lifeforms lived in Africa and the first traces of Homo sapiens have been found in Ethiopia, dating back around 200,000 years. The continent is well-known for its extraordinary diversity, being home to many different ethnicites, cultures, systems, and lifestyles. Africa is also well-known for its colonial history, having been colonised by various European countries like Great Britain and France in the late 19th century, with many nations eventually becoming decolonised and independent in the 1900s. Nigeria is the most populous country in Africa, followed by Ethiopia, Egypt, the Democratic Republic of the Congo, and South Africa, but which are the most popular cities? Let’s take a closer look at the top five largest cities in all of Africa, including detailed overviews of each location. Lagos is the biggest city in Africa. It's located in Nigeria, in the state of Lagos. Classed as one of the fastest-growing cities on the planet, Lagos stretches out across over 450 square miles (1,100 square km) and is home to around 21 million people in its full metropolitan area. Settled back in the 1400s, Lagos has grown and developed exponentially over the years to become a key cultural and economic hub for both Nigeria and the entire African continent. Lagos is home to one of the busiest seaports in all of Africa and was founded as a port city, being built on a series of islands around the Lagos Lagoon. This city was the Nigerian capital for many years and the capital of the state of Lagos too, but it has since lost both of those titles to Abuja and Ikeja, respectively. Some of the top things to do in Lagos include visiting beaches and resort locations like Tarkwa Bay Beach and enjoying live entertainment at places like Freedom Park, a former prison which has been converted into an entertainment venue. Cairo is the capital city of Egypt and is one of the best-known cities in all of Africa. It's also the second largest city on the continent and is the largest city in the entire Middle East region. The city of Cairo covers an area of around 230 square miles (600 square km), but its metropolitan area stretches out across more than 6,600 square miles (17,000 square km). 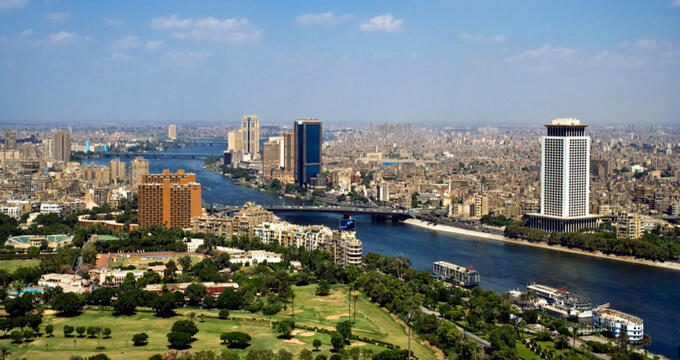 Cairo is home to approximately 20.5 million people when the full metropolitan area is taken into account. Known as 'The City of a Thousand Minarets', Cairo is regarded as a key cultural, historic, touristic, and religious location. It is best-known for its associations with Ancient Egypt due to the fact that the world-famous Pyramids of Giza and other iconic historical monuments can be found around the city, which, in its modern form, dates back to the late 10th century but has centuries more history stretching back further than that. Due to its history and landmarks, Cairo is a hugely popular touristic location and one of the most-visited cites in Africa. Kinshasa, once known as Léopoldville, is the capital city of the Democratic Republic of the Congo. It is also the country's largest city and is generally classed as the third largest city in all of Africa. Founded on the banks of the Congo River, Kinshasa covers a total around of over, 3800 square miles (9,900 square km) and is home to around 12-13 million people, with the exact number varying according to different surveys and statistics. Interestingly, Kinshasa is located right across the river from another capital city: Brazzaville, which is the capital of the Republic of the Congo. This makes Kinshasa and Brazzaville the second-closest couple of capital cities in the world. Kinshasa is the world's biggest French-speaking urban area, being even larger than Paris, and is a key educational, political, cultural, and industrial center for the Democratic Republic of the Congo. This city was founded back in 1881 by a Welsh explorer named Sir Henry Morton Stanley. Johannesburg is the biggest city in the country of South Africa and is the fourth largest city in Africa overall in terms of total urban area population. It is one of the 50 biggest urban areas on the planet and is the capital of Gauteng, which translates to 'Place of Gold' and is the richest province in all of South Africa. Johannesburg covers an area of almost 1,300 square miles (3,350 square km) in total and is home to around 9.6 million people overall. Interestingly, despite being the biggest city in the country and a key financial, industrial, and cultural hub, Johannesburg is not one of the three capital cities of South Africa. Regarded as one of the wealthiest and developed cities in all of Africa, Johannesburg is a popular touristic location with many impressive landmarks, sky-scrapers, historic buildings, and parks. Some of the top things to do in Johannesburg include admiring some of Africa's tallest buildings like the Sentech Tower and Carlton Centre, and visiting the various parks, zoo, and botanical gardens. Luanda is the capital city of Angola and is generally classed as the fifth largest city in all of Africa. This is a seaport city which covers a total metropolitan area of over 900 square miles (2,400 square km) and is home to around 7.8 million people according to the latest estimates. Luanda has a history dating all the way back to 1576, when it was officially founded as "São Paulo da Assumpção de Loanda" by a Portuguese explorer named Paulo Dias de Novais. He bought several hundred soldiers and settlers along with him who helped the city to grow and develop over time, with Luanda being an important African hub location for Portugal throughout the 17th, 18th, and 19th centuries. Luanda, along with the rest of Angola, attained independence from Portugal in 1975.